Establishing standards and practices for characterizing Mesenchymal Stem Cells (MSCs) and induced Pluripotent Stem Cells (iPSCs) is an important quality issue for the future of wound healing and regenerative medicine. Mesenchymal stem cells (MSCs) and induced pluripotent stem cells (iPSCs) are being utilized for the development of regenerative therapies for wound healing and repair. Despite the seemingly well-characterized factors and protocols used to expand MSCs and iPSCs, the efficiency and reproducibility of these procedures can vary depending on the quality of the starting stem cell population and the reagents used. Establishing standards and practices for characterizing MSCs and iPSCs is an important quality issue for the future of stem cell research and regenerative medicine. In fact, a recent commentary in Nature Cell Biology raised issues about the importance and struggle of maintaining the quality of pluripotent stem cells. This article presents some tips and resources to increase the consistency of MSC and iPSC expansion and differentiation. Identifying factors and processes that cause inter- and intra-experimental variability is an important consideration for stem cell research, where experiments are costly and time-consuming. A potential source of significant variability arises from the starting population of stem cells, which can undergo phenotypic changes when maintained in culture. Changes in stem cell potency over time confound quality control and give rise to large inter-assay errors and/or contradictory data. Interactive pathway to identify MSC Differentiation Markers. Some Antibody Panels and Multi-color Flow Cytometry Kits for MSCs, designed based on International Society for Cellular Therapy (ISCT) guidelines. Interactive pathway to identify ES/iPSC Differentiation Markers. While most verification procedures require dedicated cells which cannot be used for further downstream application, there are some options available to characterize iPSCs without affecting proliferation or differentiation capacity. While assessing marker expression on your stem cells is the low-hanging fruit for validation, it is equally, if not more important to assess the differentiation potential of MSCs or iPSCs prior to downstream experimentation or use. For iPSCs, the traditional tests for potency, teratoma and embryoid body assays, are often too time consuming and non-standardized for laboratories that require a realistic timeline and a quality controlled assay. As mentioned in the introduction, many of the growth factors and protocols needed to differentiate stem cells are known. This knowledge is being used to create a more efficient and standardized way to gauge the potency of stem cells. It is now possible to assess the ability of iPSCs to differentiate into the three primary germ layers (ectoderm, mesoderm, and endoderm) in less than a week, using kits designed for this specific purpose. Similar kits are available for assessing the mulitpotency of MSCs. Because all of the reagents are quality controlled and a defined protocol is used, these kits benefit research by the ease in which they can be inserted into the experimental workflow to help establish a standardized way to assess iPSC pluripotency or MSC multipotency. Reproducibility in stem cell differentiation protocols can be dramatically improved by using multiple techniques to confirm stem cell pluripotency. While the conservation of precious stem cells for use in downstream applications is a legitimate concern, there are tools available to perform multi-pronged stem cell validation without sacrificing cell yield. Here is a white paper showing how a single cell culture well can be used to confirm the potency of pluripotent stem cells in 3 different ways. Many researchers are now utilizing small molecules in their experiments. Using chemical compounds to expand and differentiate MSCs and iPSCs is beneficial because it allows for more precise targeting of the specific signaling pathways that lead to the cell derivative of choice. With the ever-expanding number of small molecules being published every day, the task of identifying a single molecule or two that can benefit your system might seem arduous. It may be simpler than you think. Pre-assembled compound libraries, designed for high throughput small molecule screening, are available specifically for stem cell research. For example, the Tocriscreen™ Stem Cell Toolbox from Tocris Bioscience was recently used in a publication in Stem Cell Reports showing that MESP1+ mesoderm can give rise to cardiac and skeletal progenitors. While this study was able to identify specific compounds to promote lineage-specific differentiation, the small molecule screening library also allowed the team of researchers to show that ALK4/5/7 and ROCK inhibition promote cardiac and skeletal lineage commitment, respectively. This was done by surveying the signaling pathways targeted by each small molecule and finding commonality with cell differentiation phenotypes. Using high-quality and reliably-performing reagents is the key to establishing consistent stem cell expansion and differentiation protocols. Vetting the quality of your reagents during the discovery phase of your research can not only reduce the likelihood of failed experiments and inconsistent data, but can also lead to easier translation if moving your research to the clinic. Bio-Techne has brought together under one name many life science brands that are known for quality. Of particular interest to stem cell research and regenerative medicine are Tocris Bioscience and R&D Systems, who manufacture quality controlled small molecules and proteins, ELISAs, and media, respectively. 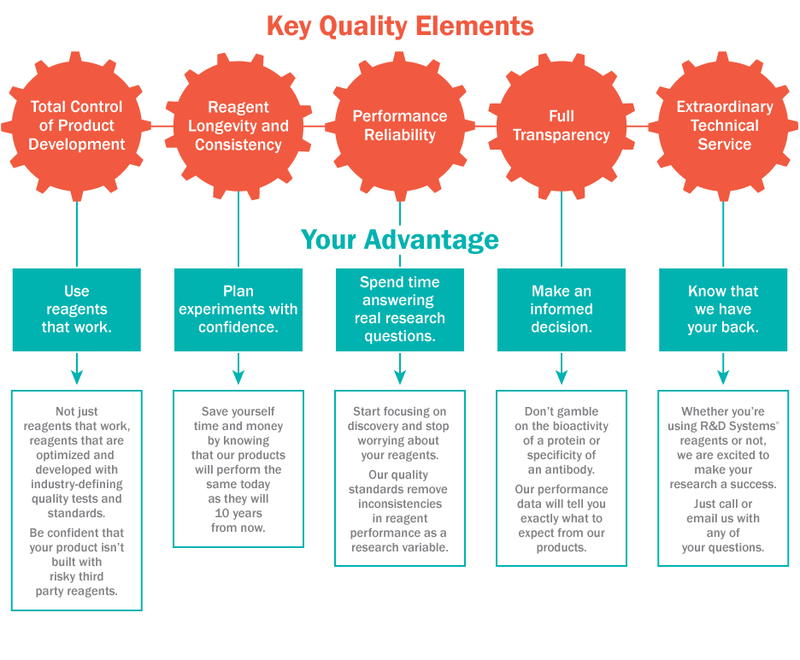 The infographic below highlights what to look for in a reagent provider, including key quality elements and how they affect your research workflow. You can learn more about the benefits of quality reagents by reading the R&D Systems® Quality Advantage.